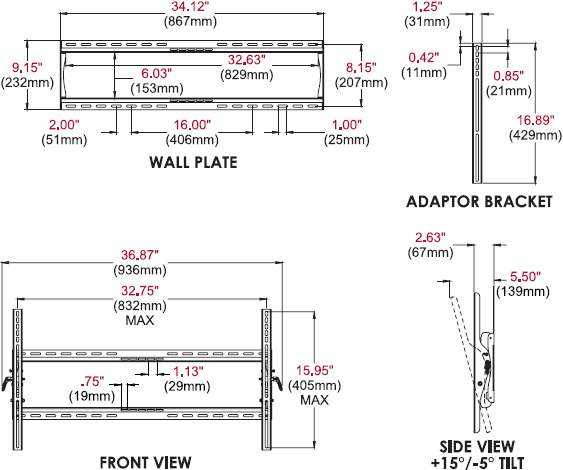 The Paramount series wall mounts provide versatile and multi-functional features. With peerless PT660, a low-profile design positions the display just 2.63" (67mm) from the wall. The Hook-and-Hang system offers easy, one-person installation of the display. The Easy-Glide adaptors hook onto the wall plate for a quick, simple, and secure installation. Achieve perfect positioning of the display with the side-to-side adjustment after installation. A ratcheting handle provides locking tilt capability for quick adjustments to the amount of tilt, reducing glare and optimizing the viewing angle. Lock the tilt angle at installation to prevent tampering or moving with the IncreLok tilt technology. Helpful Hints: The PT660’s adjustable viewing feature provides 15° of forward tilt and 5° backward tilt, creating the most optimal viewing angle. Monitor Size 39" to 90"